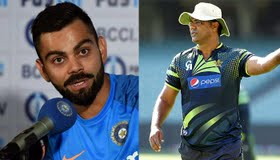 Former India captain Virat Kohli and Pakistan legend Waqar Younis have backed Sachin Tendulkar’s views that two balls in ODIS are a disaster for the bowlers and the format. After England aging thrashed Australia on Thursday, Tendulkar took to Twitter and opined, Having 2 new balls in one day cricket is a perfect recipe for disaster as each ball is not given the time to get old enough to reverse. We haven’t seen reverse swing, an integral part of the death overs, for a long time. #ENGvsAUS.